In a small bowl, toss shrimp with 1/2 teaspoon of Jamaican Jerk Seasoning; set aside. In a cast iron skillet or other oven proof skillet, combine beer, tomatoes, peppers, onions, garlic, minced thyme and minced cilantro. Add shrimp on top of vegetables and herbs. Pour melted butter over top of the shrimp and top with Thyme sprigs. Slice the bread and wrap it tightly in foil. 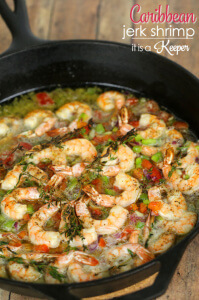 Bake shrimp and bread for 5-7 minutes, or until shrimp is cooked through. Remove shrimp and bread from the over and serve immediately.